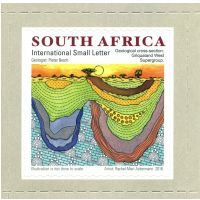 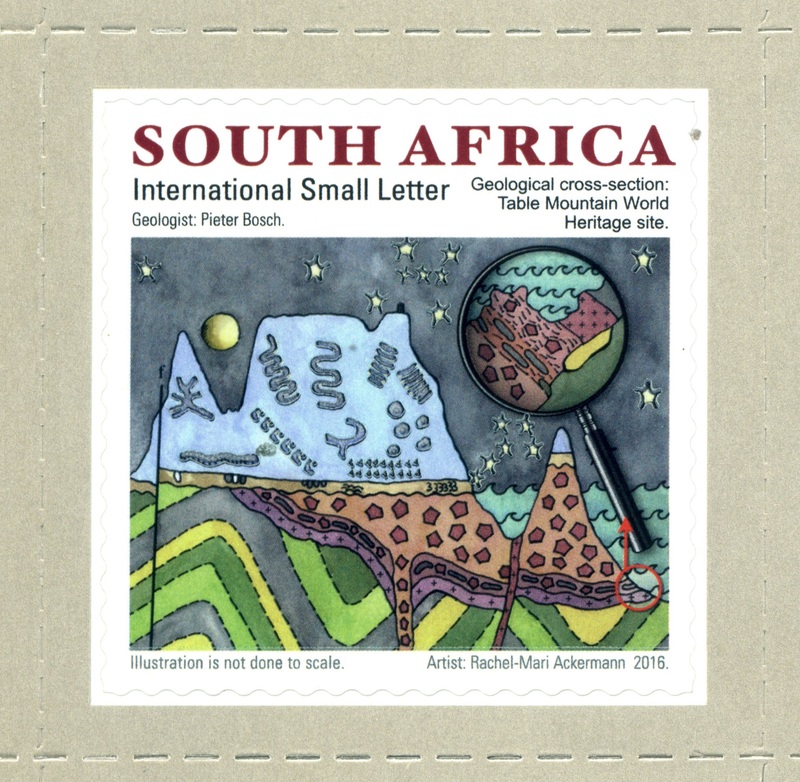 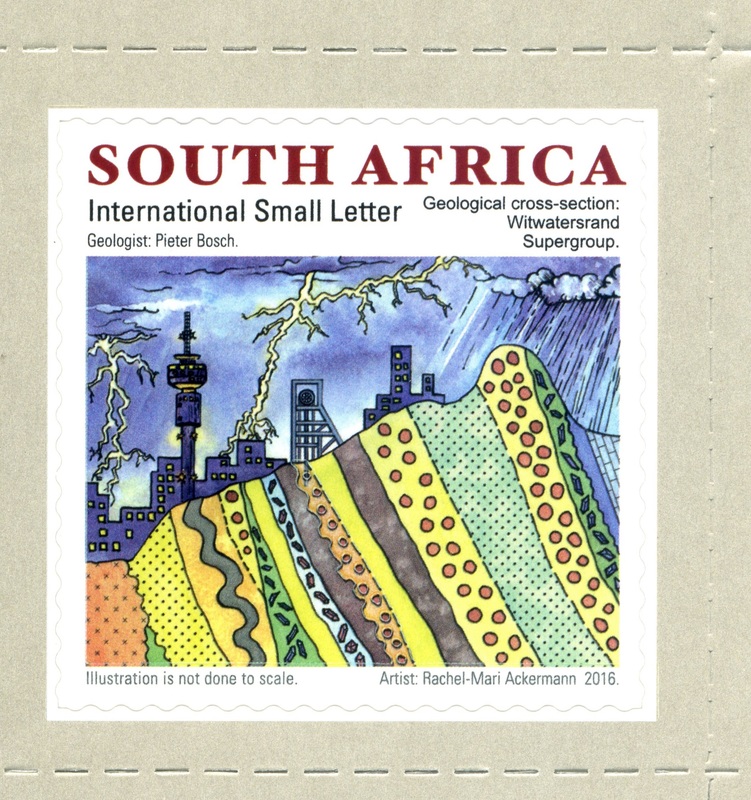 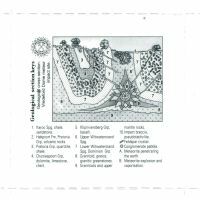 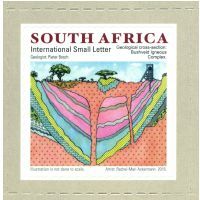 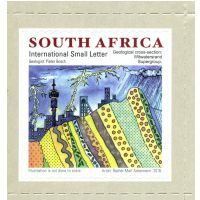 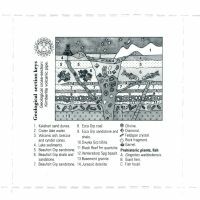 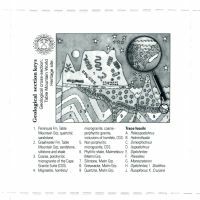 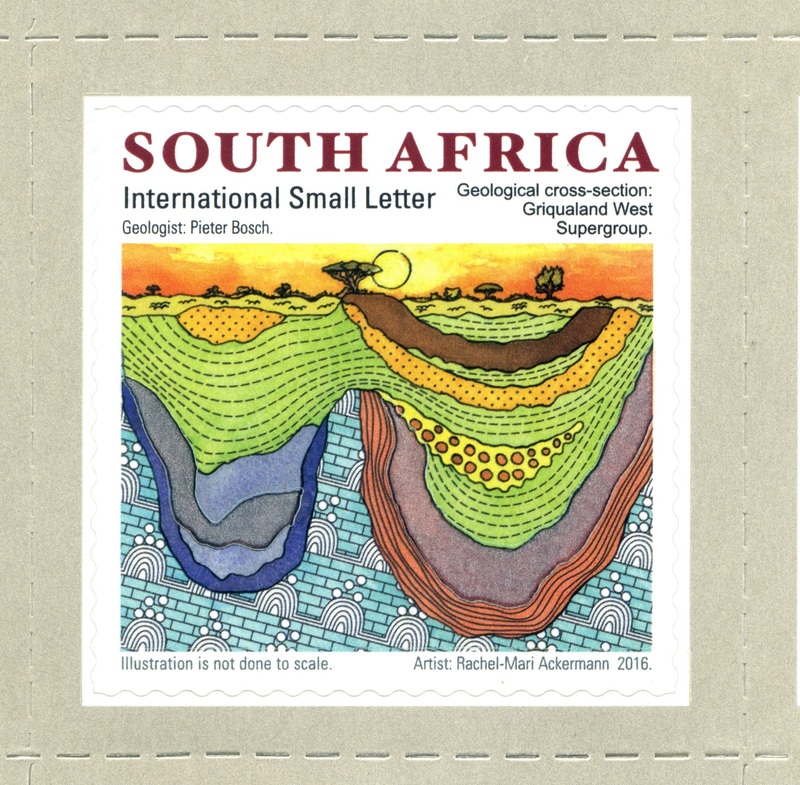 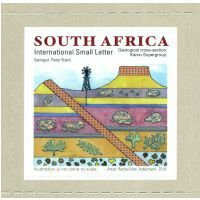 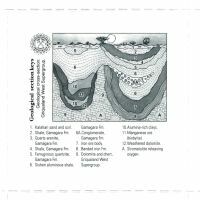 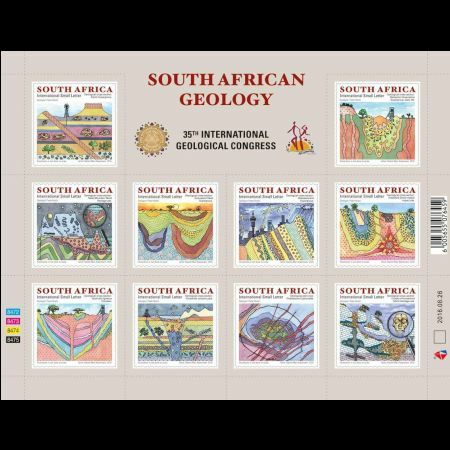 South Africa 2016 "South African Geology"
Print Technique Offset Lithography, colourless ink phosphorescent secured by a marker "Phil @ poste"
On 26 August 2016 the South African Post Office issued a sheet of 10 International Small Letter rate stamps to coincide with the 35th International Geological Congress at the Cape Town International Conference Centre. 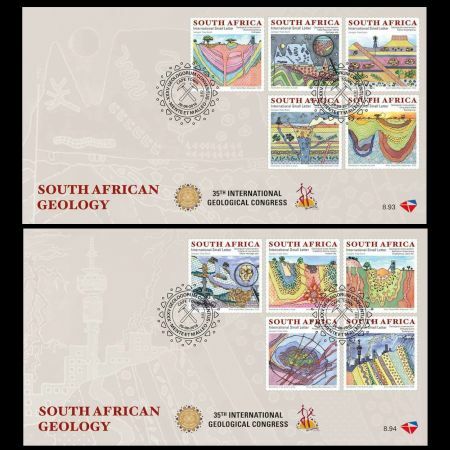 The stamps offer an artistic interpretation of ten different geological superlatives of great economic value and major scientific importance in South Africa. 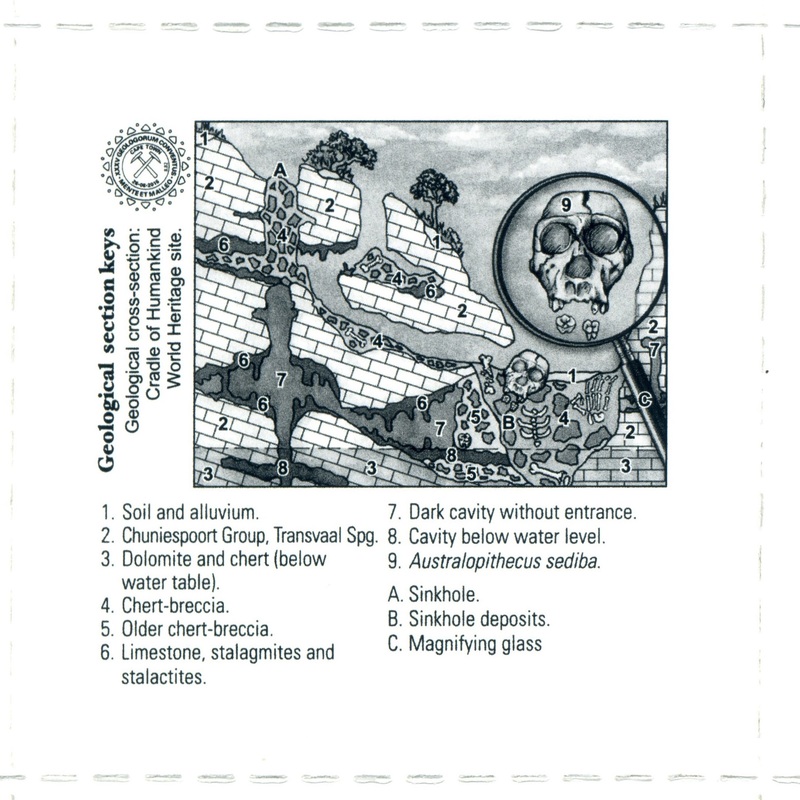 Cross-sectional keys printed on the back of the stamps. 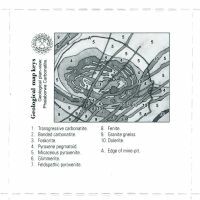 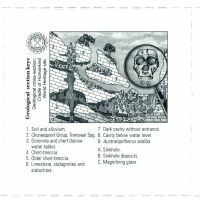 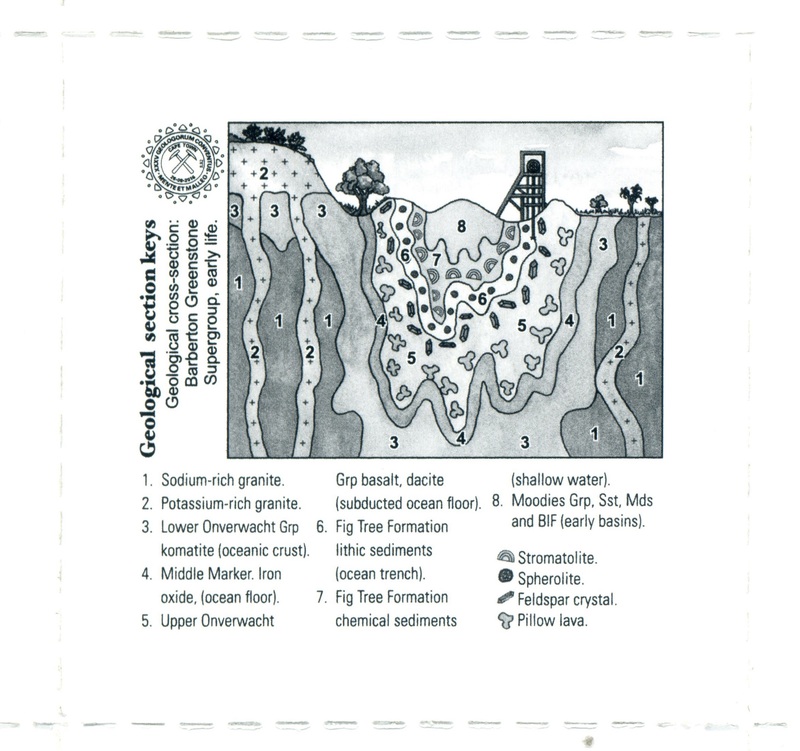 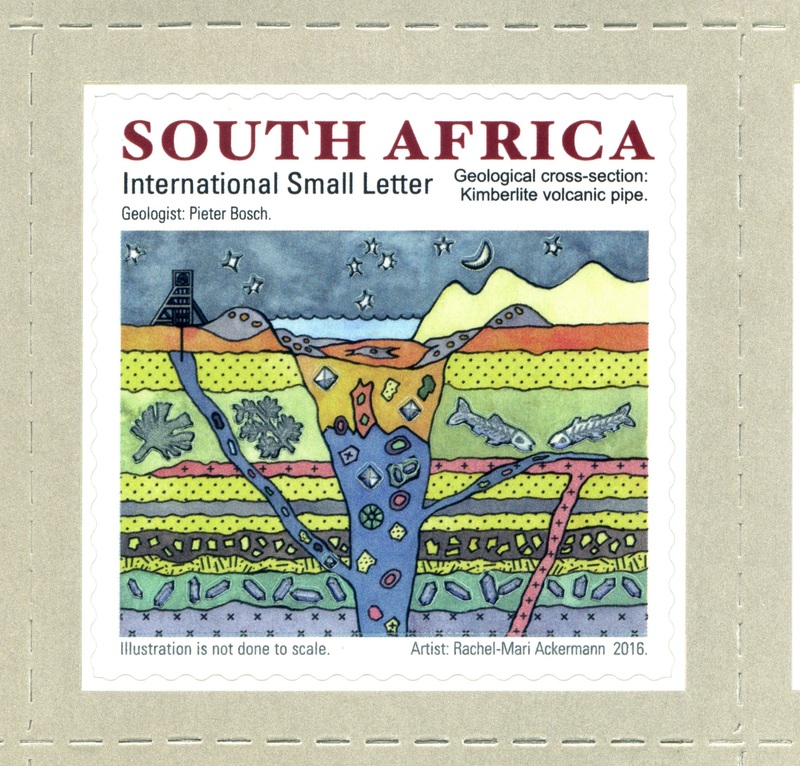 The concept designs for these stamps were researched and drawn by South African geologist, Pieter Bosch of the Council for Geoscience and the artwork was illustrated by artist, Rachel-Mari Ackermann of Philatelic Services. 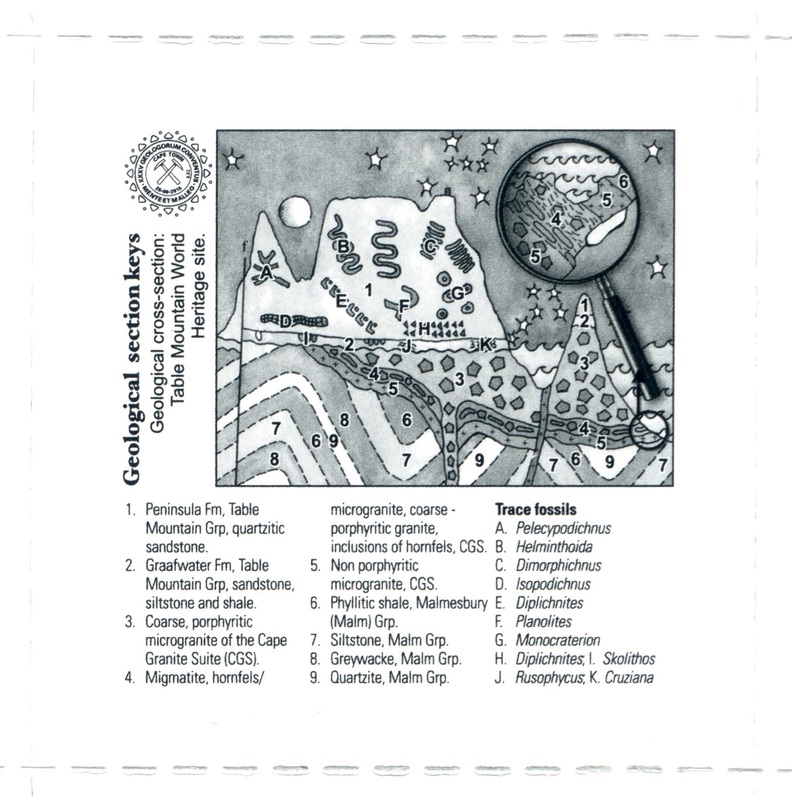 The stamps have phosphor spots at strategically placed areas that glow when viewed under UV light. 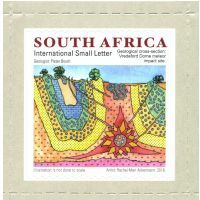 This area is located in the east of Mpumalanga, bordering Swaziland. 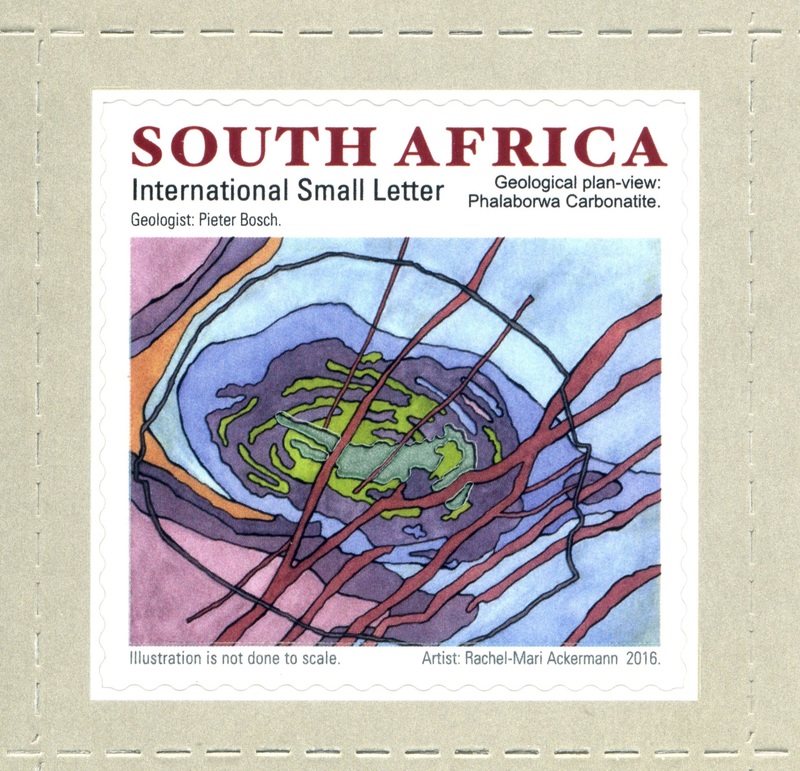 Remnants of the earliest earth’s crust are preserved in the Barberton Greenstone Belt and some of these rocks are dated at around 3,500 million years and contain traces of very early life-forms, minute blue-green algae. 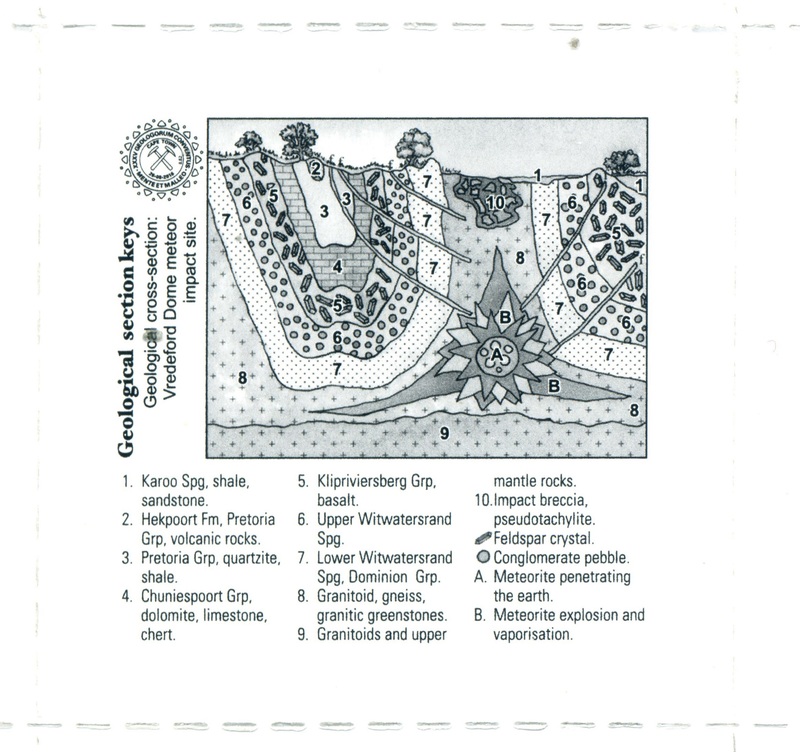 The Griqualand West Supergroup is a pile of sedimentary rocks. 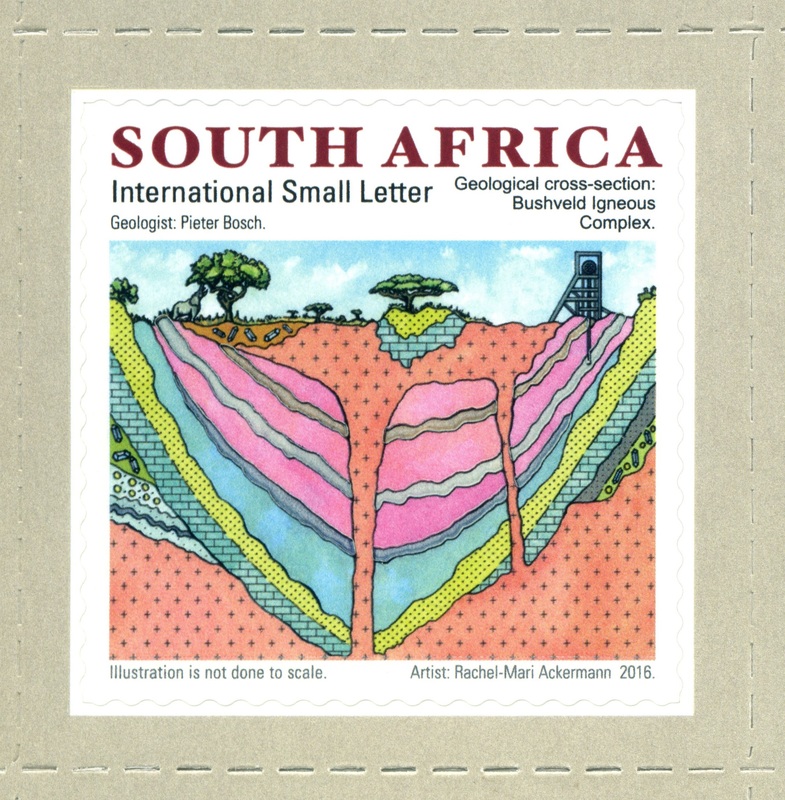 These rocks formed between 2650 and 2000 million years ago when rifting and subsidence created an extensive shallow sea in which primitive life thrived. 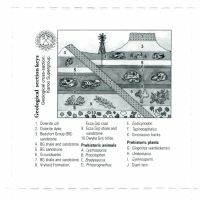 Cyanobacteria of the area and elsewhere released massive amounts of oxygen into the atmosphere and it is often referred to as the oxygen pump of the earth. 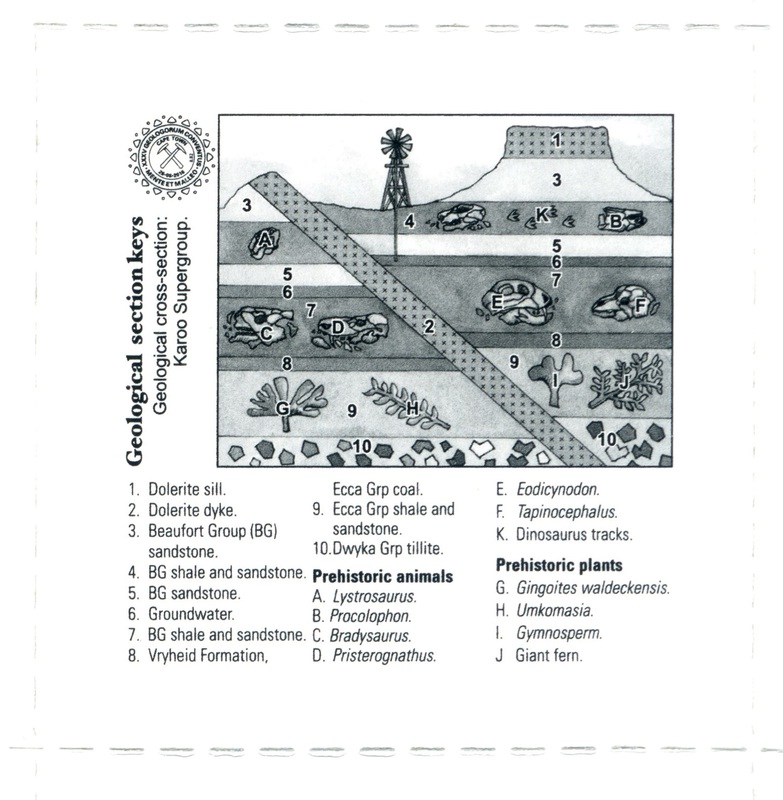 The release of oxygen resulted in the chemical deposition of iron and manganese. 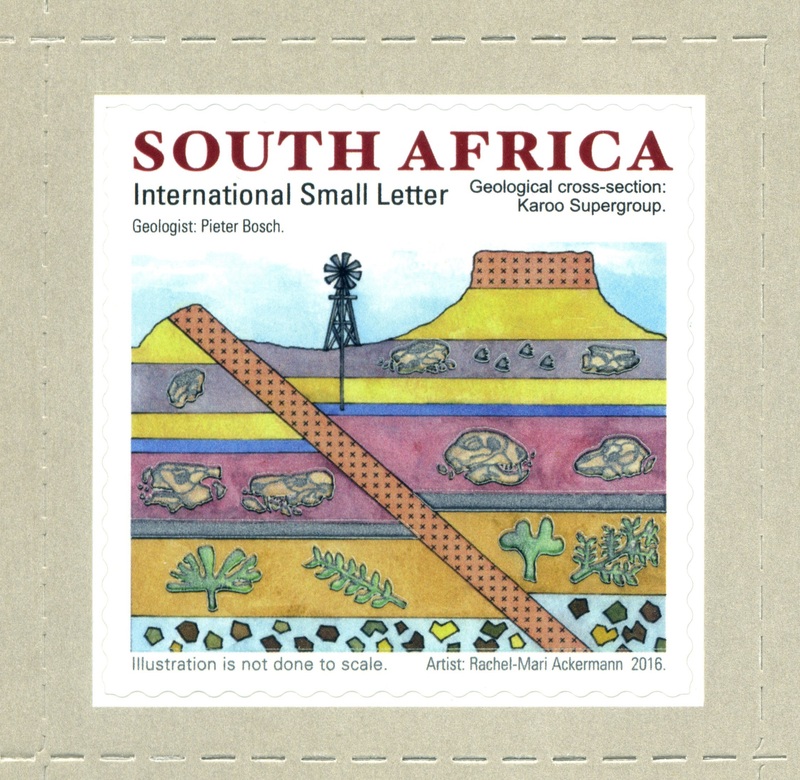 This Supergroup contains the world’s largest deposits of manganese, and it is South Africa’s main iron source. 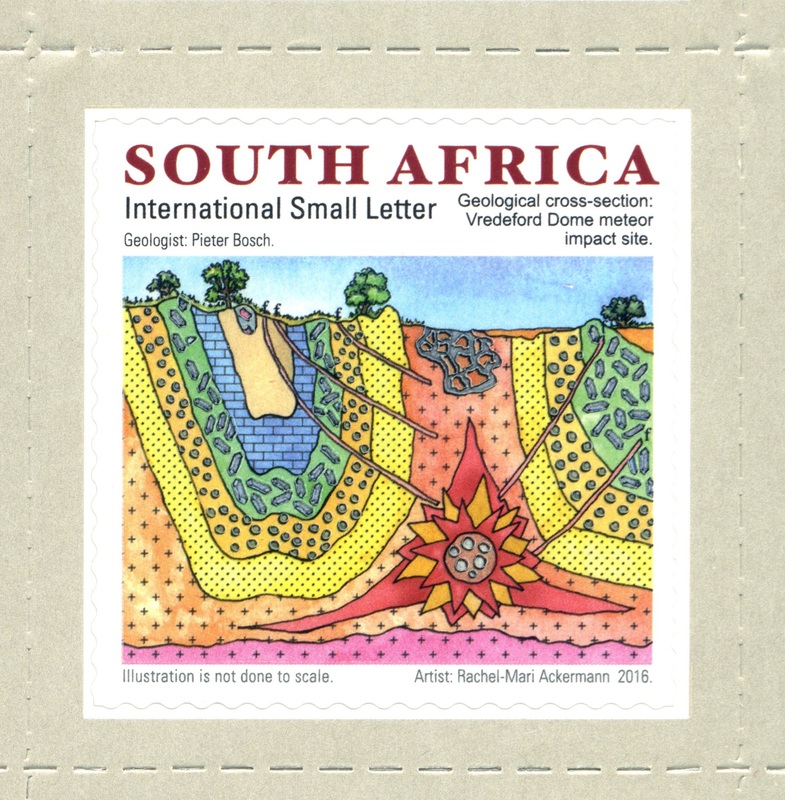 This is the oldest known meteorite impact site in the world. 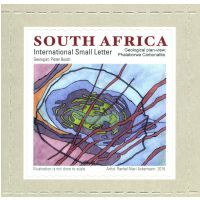 A meteorite estimated at around 10 kilometres in diameter formed an impact crater of about 360 kilometres in diameter about 2000 million years ago resulting in very spectacular scenery over an area of around 50 kilometres in diameter. 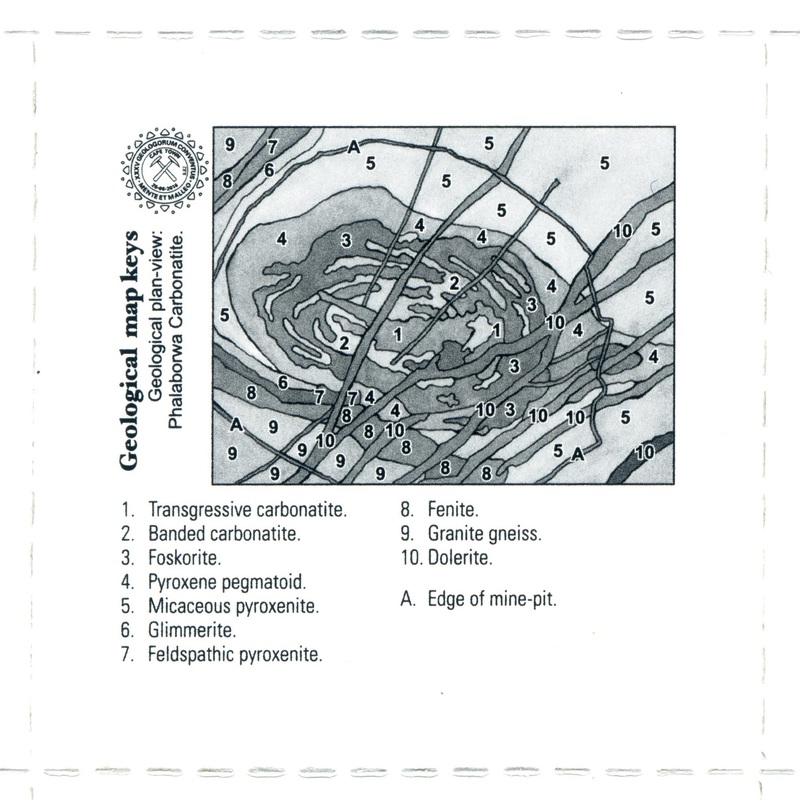 The pressure and heat of the impact folded and faulted some rock layers while some rocks were locally melted, brecciated and re-solidified to form a typical impact related rock known as pseudo-tachylite. 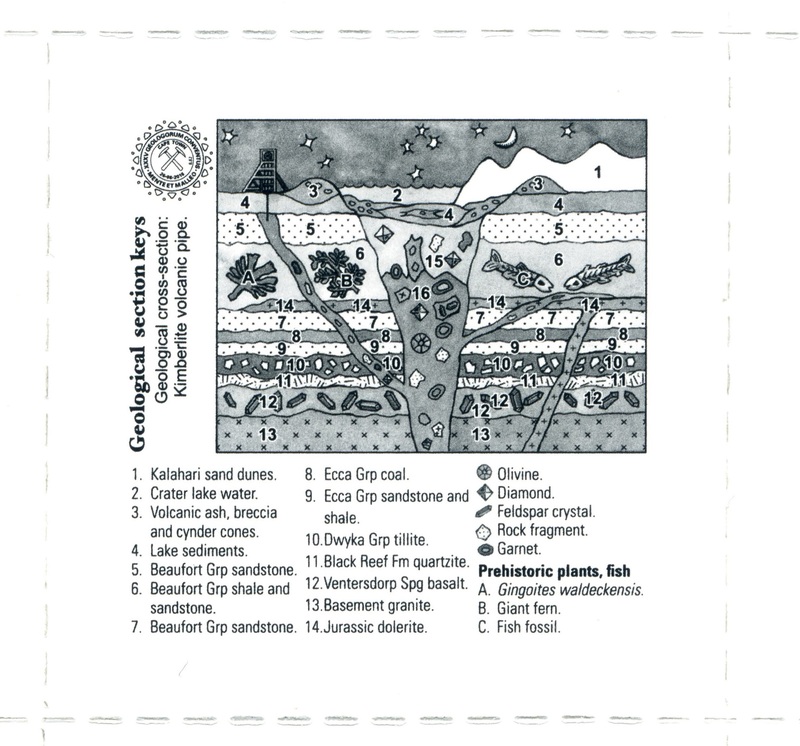 Kimberlite is the most important primary host-rock of diamonds. 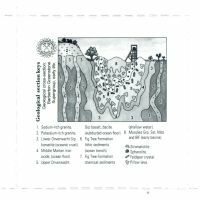 Kimberlite originates very deep below the earth’s surface, and finds its way along fissures and volcanic pipes to the surface of the earth. 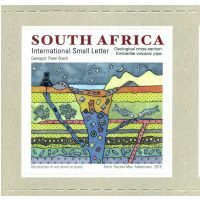 Weathering and transport of the Kimberlite and hosted diamonds gave rise to the gravels containing diamonds along the West Coast and along the Gariep and Vaal Rivers and their major tributaries. 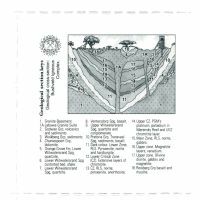 The Phalaborwa Complex is an extinct alkaline volcanic complex that was active around 2060 million years ago and it is the only economically viable carbonatite-hosted copper deposit in the world. 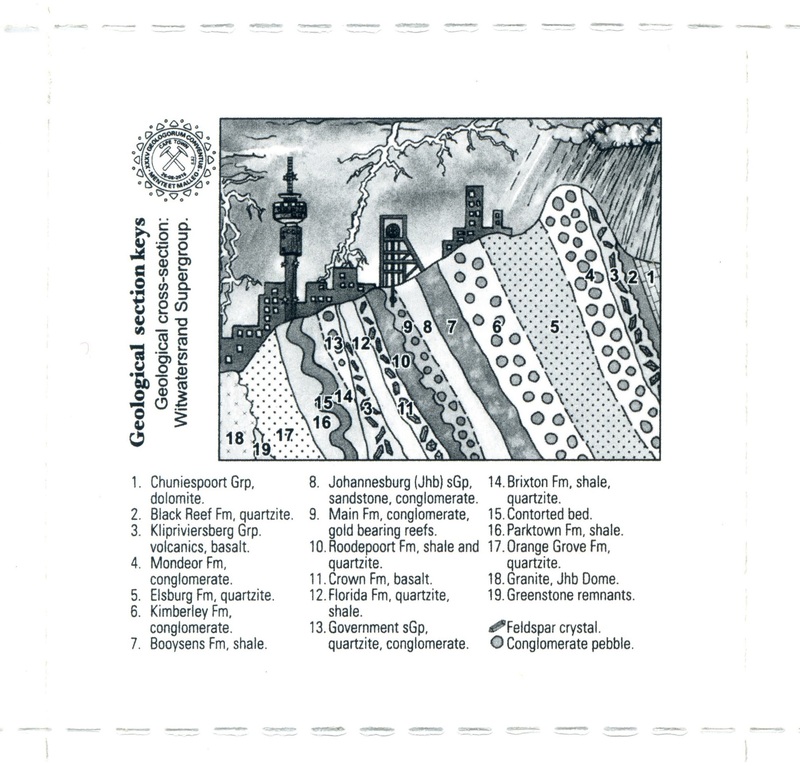 The core of the Complex, known as Loolekop is a composite intrusion with a generally concentric arrangement of foskorite and a core of carbonatite and dolerite. It holds South Africa’s largest deposit of copper. 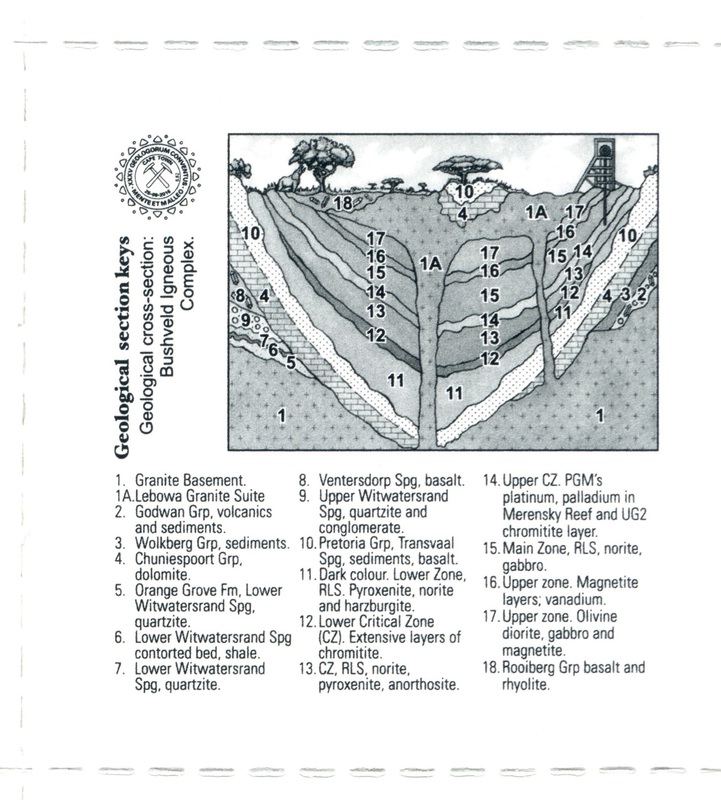 This is the most prolific source of hominid fossils on earth. 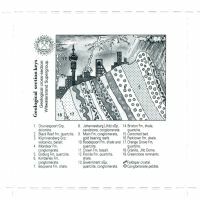 The hominids were preserved in cave systems and karstic depressions within dolomite. Little Foot”, an almost complete skeleton of another hominid dated at about 3.3 million years old. 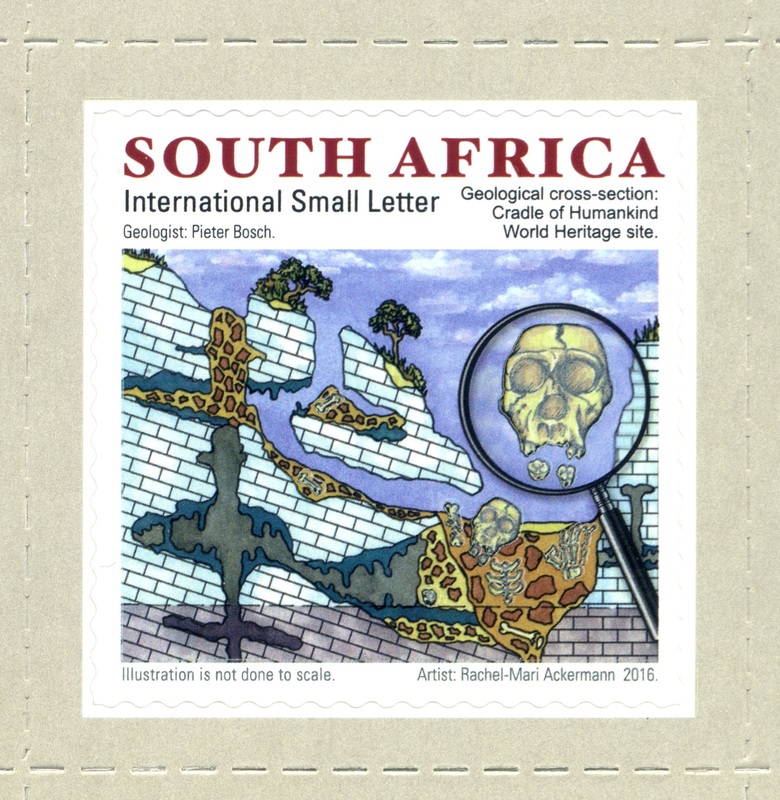 Homo Naledi”, the newest hominid. 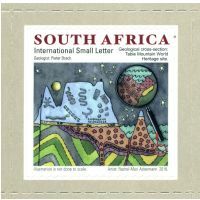 It is argued that the “Chamber of Stars”, where it was discovered, might represent the first evidence of burial by hominids. 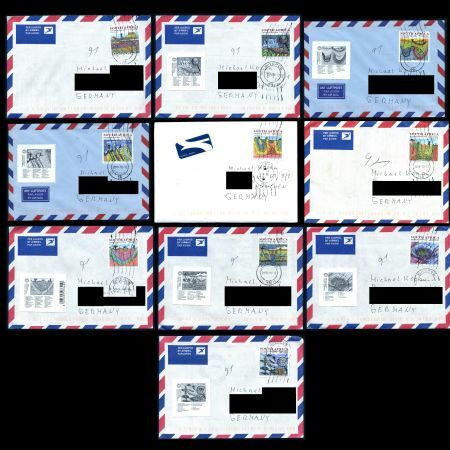 Mr. Lee. 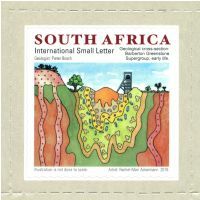 R. Berger (the finder of Australopithecus sediba) informed me that the geological structures of Malapa -where A. sediba was found- were not correct described on the stamp. 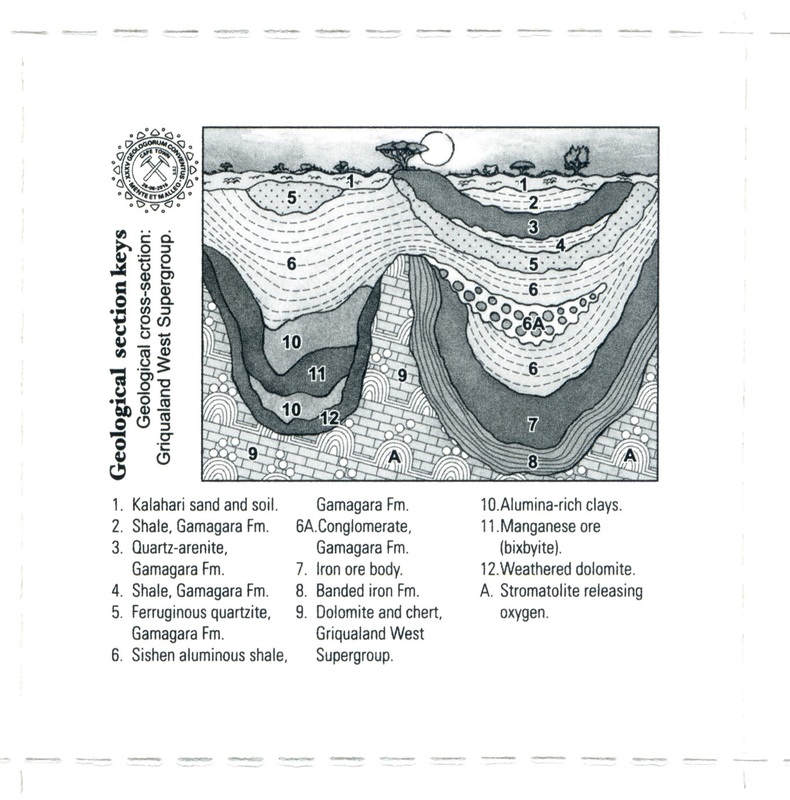 To report the differences here is a chart to show the real circumstances.